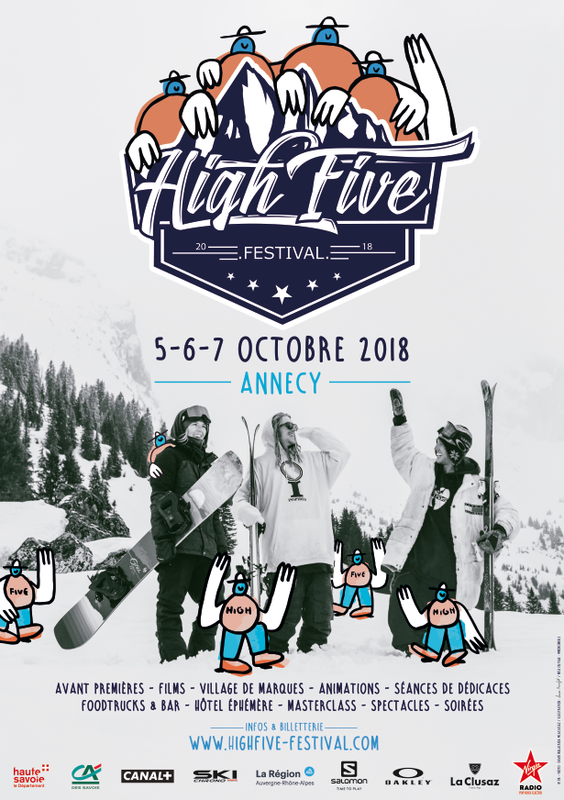 High Five returns to the lakefront of Annecy, France on October 5-7, 2018. Ski films are like powder days: they’re best when enjoyed with friends. So it’s no wonder that “friends” are the central theme of the High Five Festival, Europe’s leading freeski film festival and your best chance to watch all of 2018’s best ski movies over one action-packed weekend. Here’s our quick-and-dirty guide to this year’s High Five, taking place from October 5-7 in Annecy. Though there’s a lot of other stuff going on, ski movies are the heart of this festival, and as expected High Five delivers the new goods from all the leading ski-film production companies, as well as from hungry amateur crews. On Friday, 5 October, the program kicks off with highlights like Level 1 Productions’ Zig Zag, Would You from Jeremy Pancras, full movies from Kimbo Sessions and Zermatt Glacier Days, and Frozen Mind from Victor de le Rue. Projects from Phil Casabon, Henrik Harlaut and Tanner Hall spice up the program on Saturday, 6 October alongside the epic-looking Zabardast expedition film, capped off with Far Out from heavy hitters Teton Gravity Research. On Sunday, 7 October Eva Walkner and Jackie Paaso’ s Evolution of Dreams will make its debut, while the Robin Gillon film Sound of Silence, Color from The Bunch and Before Blank from the Blank Collective make for a diverse program. It’s all capped off with Matchstick Productions’ All In on Sunday night. The movies are divided into 13 different viewing sessions over the weekend, and you can buy individual tickets for the sessions you want to attend. All showings are at Annecy’s Cinéma Pathé. Click here for the full program (PDF). Yes, that’s French for activities—of which High Five has many! Last year’s Sosh Big Air has been replaced with the Oakley Big Air Bag, a setup that, somewhat amazingly, will be open to the public throughout the weekend! You read that right—here you’ll be able to take your turn in the lineup, with some coaching from the likes of Øystein Bråten, Henrik Harlaut and Sarah Hoefflin. Other diversions for the active-minded include a separate air bag setup, trampolines, a biathlon clinic, basketball and soccer tournaments, and even the chance to give one of Andri Ragettli’s wild parkour workouts a try. For those looking to stay more grounded, other activities like autograph sessions, a photo exhibit and of course, the ever-present Brand Village full of tantalizing new gear, will all keep you busy between film sessions. If all that action is making you hungry, make at stop at the new Central Food Trucks munchie zone, where you can chow down on pizza, burgers, poutine, Asian, and of course all of the cheese you can handle. What would a ski film festival be without the parties? High Five will be taking over Annecy’s Pop Plage club for the weekend with big parties on Friday and Saturday night. Featuring live music, a rooftop, street food and a new cashless pay system, here’s your chance to drink a few cold ones and get down on the dance floor alongside your favorite film skiers. So what are you waiting for? Find a rideshare here, book your tickets online, start dusting off your French, and get ready for a season kick-off that you won’t forget anytime soon. Ski Ballet. Revolving Carpet. No Words.